The Transfer Window – How was it for You . The transfer window has been the usual combination of manic excitement and desperate frustration for most of the people involved. Every year once it’s finished there’s always plenty of calls for it to be abolished, brought forward or shortened to avoid some of the more bizarre aspects of the inevitable last minute free for all just before the window shuts. Changing the rules of engagement would of course take away much of the average football fan’s summer entertainment and perhaps the reason for this transfer window being so protracted, chaotic and exciting was because there was no major international football tournament around to distract us. A chart drawn for the moment the window opened, however shows the real picture. In sporting charts you always look at the Sun, Mars and the Moon in that order. The Sun and Mars are in Gemini, the sign of movement and communication and the mobile phones of football agents alone must have surely clogged the airwaves this summer. There is always lots of toing and froing with Gemini but its often without any consistent direction or end product in mind. If ever there was an astrological significator for confusion, the Moon conjunct Neptune in Pisces would have to be it. So Sun / Mars in Gemini square to Moon/ Neptune in Pisces sums up the ensuing chaos beautifully. Saturn sits near the top of this chart and is the principle of limitation and restraint. Its dominance here shows the futility of much of the Gemini / Pisces running about. Saturn’s position at 6 degrees Aquarius has thwarted the plans of many of the top premier league managers, particularly David Moyes as the ringed planet was opposite his Sun and Arsene Wenger who had it on his Moon for most of the window. Capricorn research had a very good window and many of the predictions made came true but also the general description of the conditions over the summer was actually featured in Saturn in the transfer window published at the beginning of August. So how was the window for your club? A quick look at the noon charts for some of the incoming players may help give us a sense as to whether they will settle quickly or were purchased as part of a long-term strategy or if it was all a terrible last minute loss of marbles by a desperate manager. Talking of which we should start with Arsenal. Just to reiterate, Saturn has been sitting on Arsene Wenger’s Moon for most of the summer preventing any of his supposed transfer targets materialising. It finally moved away right at the end of the window just allowing enough time for a last-minute trolley dash to Madrid to return triumphantly with Mesut Ozil. Over £40 million has been spent on one player that is more than 2 1/2 times arsenals previous transfer record. The all-round congratulations with which this transfer has been acclaimed almost gives the impression that it was planned all along. Of course it wasn’t, for Wenger it must’ve been such a relief to finally get rid of Saturn that he’d be happy with someone / anyone as long as it was a big name. Ozil has a short name but a big reputation, and Arsenal fans will sincerely hope that this one move does the business for them. Hope and faith in his skills will have to do here because Ozil has no transits to speak of for the coming season, good or bad. In fact he has nothing happening astrologically until next June when a Jupiter transit may well come in handy for German World Cup bid but will be of little use to Arsenal. Some people might say that nothing happening throughout the whole of the transfer window until the final moment when a decent player is finally obtained could be seen as part of a bigger pattern for the Gunners. Indeed the last few seasons have been pretty mediocre and brought much criticism Wenger’s way but on each occasion the critical voices have been dispersed by a late dash to secure fourth place often at the expense of arch rivals Tottenham. It’s always good to look for patterns but its Astrology that will actually show which ones are relevant. The last-minute capture of Ozil will no doubt keep the wolves from the door for a while but it’s unlikely to be enough to turn Arsenal into genuine title contenders this season. Wenger can’t even rely on his old mate Matthieu Flamini who is looking at a difficult season with Saturn opposite his Moon in the Autumn and conjunct his Mars in the Spring. At Aston Villa, Paul Lambert has brought in Czech international Libor Kozak and despite many fans not having heard of him Kozak has made a big breakthrough over the last year aided by Pluto and Uranus aspects to his Moon. These two planets continue their influence but also Jupiter is conjunct Kozak’s Mars in November, December and May so it’s looking to be a great debut season for him. Villa’s biggest coup has been to keep hold of Christian Benteke who despite wanting to leave has been kept out of the clutches of Spurs and other interested clubs by an extremely firm stand from Lambert and Villa owner Randy Lerner. Benteke has signed a new contract and Villa will no doubt be hoping that the magnificent progress he made last year will continue this season. Jupiter was opposite his Sun for most of last season and his marauding exploits reflected this beneficial transit. The same planet was handily conjunct his Moon for the signing of the contract but there’s nothing of the same for the coming season. Neptune has been square his Mars during his breakthrough time in England and that transit remains until February, so Benteke should keep going reasonably well but without the same impact as last year. Cardiff City and Malky Mackay have gone for a number of new signings to celebrate promotion to the Premier league. Most of the incomers are relatively unknown although they have got Steven Caulker from Tottenham on the basis that he did well down the road at Swansea on loan. 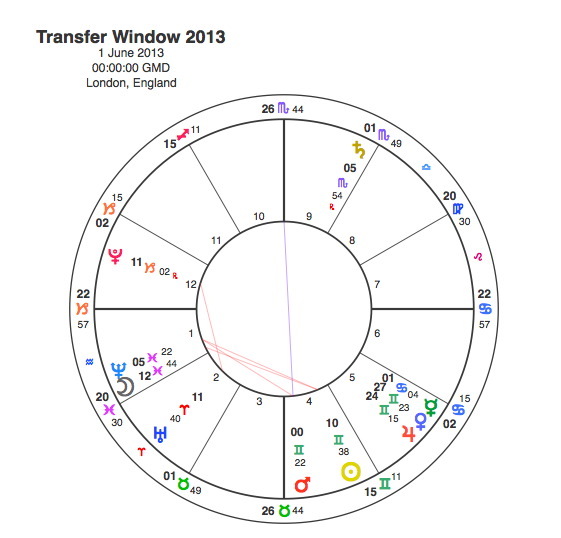 Caulker’s time at Swansea and his subsequent breakthrough into the England squad with his goalscoring debut was brought about by Pluto’s conjunction with his Sun in 2011 and 12, the most powerful of all possible transits. Pluto to the Sun will either mark a person’s big breakthrough or the peak of their career and both Caulker and Cardiff fans will be hoping it was the former. Steven Caulker, however, has no transits to speak of this season so still remains a figure of promise but there’s no immediate guarantee of a quick payoff for the Welsh club. Gary Mendel, the Chilean defensive midfielder became Cardiff’s record signing from Sevilla this summer. Unfortunately Medel has Saturn square his Sun and Mars and conjunct his Moon for the coming season so things could be pretty tough for him. Astrologically it doesn’t look as if these two will have much impact on Cardiff’s fight to preserve their premiership status. For Jose Mourinho’s Chelsea the briefly on but mostly off transfer of Wayne Rooney from Man United has been one of Saturn’s casualties. Rooney has the Sun at the beginning of Scorpio and Saturn plagued him for most of last season. The opposition between Wayne’s Sun and that of David Moyes led Capricorn Research to the view that a move to Chelsea would be in the England star’s best interest, but Saturn and United’s fear of giving the title away wouldn’t allow it so no move happened. Mourinho had Saturn square his Sun for the much of the window so we will never know if he really wanted Rooney or whether it was all part of an elaborate plot to destabilise the Old Trafford set up. Chelsea did get Andre Schurrle before Mourinho arrived but he is another Scorpio about to suffer a Saturn / Sun conjunction this Autumn and it looks like the German forward will find it difficult to establish himself amongst the many stars at Stamford Bridge. Jose certainly didn’t bring anyone in until a late derailment of Spurs plans brought Willian to Chelsea. Astrologically this is a major coup, for the last couple of years Willian had Pluto and Uranus aspecting his Mars, a big breakthrough sign for any player. Uranus remains conjunct the Brazilian’s Mars and Jupiter aspects both his Moon and Mars this season. Apart from a brief Saturnine period in November and December this should be a very good season for Willian. As for Samuel Eto’o there are no transits of note on the horizon, which tends to confirm the suspicion that he was brought in just to challenge Fernando Torres. It’s unlikely that his time at Stamford Bridge will be the peak of his career. Any Chelsea fans who are worried about where Juan Mata fits in should understand that Saturn is currently opposite his Sun. With this transit he was never going to be sold but wouldn’t be in the team either. Saturn stays in the same place for much of September and then is square to his Mars for the first half of November. So it will probably take Mata a while to get going this season and he may not reach his peak of the last couple of years until 2014 -15 when Jupiter transits his Sun and Mars. Crystal Palace and Ian Holloway have picked up Marouane Chamakh from Arsenal, a classic target man but probably not at the level to hold down a regular place with the Gunners. Palace should benefit here as Chamakh has Jupiter opposite his Sun for much of the season including the end of May so he might even be the figure that keeps the club in the Premier League. Dwight Gayle has also arrived this summer and there is much hope for him but astrologically this year could be a struggle as Saturn is conjunct his Moon. Gayle is one for the future, however and 2014 -15 should be more productive for him as Jupiter appears on the horizon. Everton have lost Marouane Fellaini but their fans will be happy they’ve managed to keep Leighton Baines. New manager, Roberto Martinez appears to have played it relatively safe by bringing in some of his old Wigan players and as a general rule a couple of Scorpios like James McCarthy and Arouna Kone could be relied upon to dig deep and run through walls for you. Martinez is no astrologer however, otherwise he would have known to leave them in the Championship for another year as Saturn will be conjunct both their Suns for much of this season. It is possible that Jose Mourinho has astrological insight to go with his many other talents since he has dispatched Romelu Lukaku to Everton on loan for the season. Lukaku has a very powerful chart but this season he has Saturn opposite his Sun and square his Moon, so he would have struggled to get a game at Chelsea. Martin Stekelenburg has gone to Fulham and lets face it a few years ago he would have been aiming to join their local rivals, but some tricky Neptune aspects to his Moon and Mars have undermined his progress recently. There is still bit of Neptune left to be played out but otherwise nothing going on. There’s no clear astrological help for Stekelenburg for the next couple of years so regaining his previous status will be hard. Scott Parker, however has the aid of Jupiter square his Sun this Autumn and at the end of May so any disappointment at not getting playing time at Spurs should be soon forgotten. Another ex Spurs midfielder hoping for more playing time is Tom Huddlestone at Hull City. He will surely get his wish with the Tigers but not much more as there are no transits of any note for him. Brendan Rodgers at Liverpool has been fully occupied during the window, not least by standing firm against Luis Suarez wish to jump ship to Arsenal. As predicted during the height of the 40million and 1 saga, in What Next for Luis Suarez, Uranus and Pluto who caused all the trouble are now going backwards and everyone is so happy you would think that nothing had ever happened. There is more to come, however, so much that the whole story needs another blog of its own so watch out for that one. Iago Aspas may find it difficult to get established as he’s got Saturn in square to his Mars in November. He is one for the future and will have a good season in 2014 -15 with Jupiter conjunct his Sun and Mars. Otherwise Liverpool seem to have acquired a job lot of central defenders. Kole Toure, who we all know from his exploits with Arsenal and City must have been quite surprised to be picked up by a big club at this stage of his career and this was confirmed by jupiter being square to his Sun and Mars when he signed for Liverpool. There’s nothing much else going on for Toure and its likely he will be taking a back seat once Tiago Ilori and Mamadou Sakho get settled in. These two have both had massive Pluto, Uranus and Jupiter aspects over the last year or two, particularly Sakho. Liverpool will hope that their form and potential continues and Ilori keeps these transits up to the New Year at least while Sakho has them running for the whole season. It should be a great season for both with the only worry that both have their Mars in square with Suarez’s Mars so maybe keep them apart in training. Simon Mignolet also has the same three planets in aspect to his Mars and already has made a great start saving a penalty on his debut. Mignolet has got decent transits for the season and nothing to worry about on the horizon until 2018, so the perfect goalkeeper for Liverpool. Bizarrely, just to cap it all Luis Alberto had Pluto, Uranus and Jupiter doing the same thing to his Mars over the last couple of years although his transits are wearing off now. Whoever is currently responsible for the shopping at Liverpool is either extremely lucky, getting astrological assistance or has their Sun or Moon around 10 degrees Cancer or Capricorn. Brendan Rodgers should benefit from the best club performance of the transfer window. As a rule its a good idea to get your targets in early, it gives the new boys a chance to have a full pre season with the club and the idea is that everyone knows their roles by the start of the season. In Man City’s case it may have been too early as obviously no one had time to sit down and look at their new stars transits for the early part of the season. Fernandinho has a difficult start with Saturn aspecting both Sun and Moon in the Autumn, there’s no great hope for instant improvement either with Neptune square his Mars in the Spring. Stevan Jovetic has Saturn conjunct his Sun for September and October but there’s nothing partiularly inspiring after that either. Alvaro Negredo will have a mixed year, some Jupiter and some Saturn but November’s not looking to good at the moment. At least Jesus Navas will have a good year with Jupiter square his Sun so there should be a decent supply of crosses. City will hope Sergio Aguero stays fit as the others would be too slow to get on the end of them for the first part of the season. Whoever is doing the shopping for City is either very unlucky or has their Sun and Moon around 5 degrees Taurus or Scorpio. City of course will always win through in the end but perhaps they should employ Capricorn Research as a consultant, they could afford the fees after all. Trouble is the Premier league would become as competitive as its Scottish equivalent. The story or non story of the window has got to be Man United’s dealings. As predicted in David Moyes, A Safe Pair of Hands, Saturn opposite the Sun is no transit to have when you want to get your new reign off to a start with some big name transfers. Currently much of the flack for United’s lack of signings is being taken by Ed Woodward, the new David Gill. Capricorn Research has so far been unable to find any birth date for this person. Either he doesn’t exist or he’s read the recent blog Daniel Levy – The Thin Controller and has been hiding the evidence in fear of a chart comparison. Only in the final hours of the window did Saturn allow anyone through the gates at Old Trafford. Unfortunately this was another case of new manager heading back to old club to take another Scorpio who has served him well in the past. Saturn has been called all kinds of things over the centuries and cunning, miserable sod would be quite mild for the planet that allowed Marouane Fellaini to jump ship to United knowing full well that it’s passage through Scorpio would present another opportunity to kick Moyes in the teeth. Fortunately for United, Saturn doesn’t reach Fellaini’s Sun until 2015. Unfortunately there are no favourable aspects for Fellaini, unless you count Jupiter square his Mars in July just in time for Belgium in the World Cup. Wilfried Zaha was confirmed so long ago that its easy to forget he arrived during the window. Its a big step up though and he will find it hard this season because he’s another Scorpio with Saturn aspecting both his Sun and Moon. United of course managed to hold onto their most famous Scorpio, Wayne Rooney but he had his Saturn experience last year and things should get better from now onwards, just as long as he keeps away from Nemanja Vidic in training. Of course normally a team full of attacking Scorpios would be world beaters ( Pele and Maradona to name but two ), just not this season. As Newcastle did no business at all they will have to be left blank. If loan signings were on the agenda this blog would never get finished. At Norwich, Chris Hughton is one of those managers that keep a fairly low profile but still receive a fair amount of praise. His transfer dealings have followed the same pattern but unfortunately his new strike force may keep a similarly low profile for the time being. Ricky Van Wolfswinkel had lots of powerful Jupiter transits during the 2011-12 season, but of course Norwich would never have got him then. There’s not much in store for this year though. Gary Hooper has always had the confidence that he could make a big breakthrough in England, perhaps not immediately though as he has Saturn opposite his Moon during the Autumn. Southampton have picked up several new signings, chief among the Victor Wanyama and Daniel Osvaldo. Both of them have Saturn aspecting their Mars at times this season so what looked like a couple of big prizes may take some time to hit their stride. For Stoke, Marko Arnautovic has Pluto, Uranus and Jupiter aspecting his Moon which sounds quite promising. The trouble is no birth time is available so there is no idea when these transits are in operation, in fact they may already have passed. Erik Pieters has had the same group aspecting his Mars so this has been his breakthrough year, the aspects continue for the rest of the 2013 although they are tempered by Saturn being square his Sun in November. Paolo Di Canio brought a number of players in on loans or for undisclosed amounts. The only recognisable new name was Emmanuele Giacherini, an Italian international who is likely to have a tough debut season in the Premier League as he has Saturn hitting both his Sun and Moon followed by a debilitating Neptune square Mars. Wilfried Bony should be a hit at Swansea this year with Pluto, Uranus and Jupiter on his Mars. Jonjo Shelvey is an unknown quantity, he will have Neptune on his Sun from the end of this season for a couple of years. This is one of the hardest transits to predict and its not always such a great aspect for footballers but Shelvey is a Pisces, and Neptune his Sun ruler so it could be an inspirational time for him. Tottenham have run their own transfer window and in the future every Premier League club’s transfers will be conducted by Daniel Levy. Since they have been announcing new players almost daily, its amazing to find their bank balance is healthier than in June but that’s the wonder of a Spanish Bale out. The new boys look awesome on paper, but how about on birthchart ? Roberto Soldado had brilliant Jupiter transits for the last 3 years, but that would always be difficult to follow and now its all looks rather uncertain with Neptune square the Sun for the next two. Christian Eriksen has not much going on this season, his best transits were a couple of years ago. Nacer Chadli has some difficult Saturn contacts this season but next term would be when Spurs fans see the best of him. Vlad Chiriches will have a tough start to the Premier League with Saturn conjunct his Sun. Paulinho has nothing going on at all but that won’t stop him having the time of his life back home in the World Cup when Jupiter is conjunct his Sun. Andre Villas Boas, the Spurs boss is right to dampen expectations as they will clearly take time to gel. Etienne Capoue however, should have a wonderful season with Jupiter conjunct his Sun but best of the lot will again be Gareth Bale with the largest planet heading through his sign, Cancer. Oh ….hang on a minute – well will it be enough for Real Madrid to win La Liga ? – maybe another blog needed for that. West Brom are another club that went for a supermarket sweep this summer, taking some interesting loans and free transfers. Most of the money went on Victor Anichebe and Stephane Sessegnon. Both players have difficult Saturn / Mars contacts in October and nothing else for Albion but Anichebe has some nice Jupiter transits just in time for the World Cup or the beach. West Ham bought Stewart Downing who, poor soul, is due for another difficult year with Saturn on his Moon and Mars. A good place to finish is with Andy Carroll who will have a great season with Jupiter opposite his Sun and with massive transits coming up for 2015 – 17, might be worth £ 35 million in a few years time. Carroll and Sam Allardyce were obviously made for each other. So the winners of the astrological transfer window are Liverpool and the losers Man Utd, not a phrase we’ve heard that often recently. Could this be a star sign of the times ? « Daniel Levy – The Thin Controller.